One cake flavor I’ve been dying to make is lemon meringue! Since it’s finally starting to feel like summer, I figured it was time to test it out. 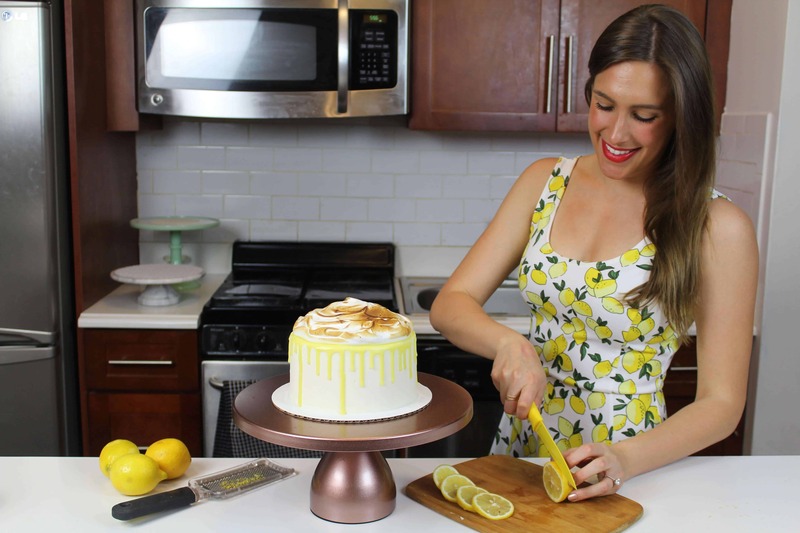 To make this cake reminiscent of a lemon meringue pie, I filled it with lemon curd, frosted it with a lemon buttercream, and topped it with toasted meringue. The decorations on this cake is really easy and simple, making it the perfect cake to whip together for a summer get together. This cake is much smaller compared to my normal cakes! It is made using a half batch of my go-to layer cake recipe, and feed around 12 people. Preheat oven to 350°F. Line three 7” round pans with parchment rounds, and grease with non-stick cooking spray. Mix together all dry ingredients (flour, baking powder, sugar, and salt) in a stand mixer with a paddle until fully combined. Mix chunks of room-temperature butter slowly into the dry mix, on a low speed. Continue to mix until no large chunks of butter remain, and the mixture becomes crumbly. Pour in egg whites, and mix on low until just incorporated. Mix in the buttermilk in two installments, on a low speed. Add in lemon juice, lemon zest, and oil, and mix at a low speed until fully incorporated. Scrape down the sides of the bowl with a spatula, then beat on medium speed for about 30 seconds. Divide evenly between the prepared cake pans. Bake for 35-37 minutes. Allow to cool for 10 minutes, then run an offset spatula around perimeter of the pan to separate the cake from the pan. Place cake layers into the freezer for 45 minutes, to accelerate the cooling process. Once the layers have fully cooled, trim the caramelized bits from the sides of the layers using a serrated knife. As the cake layers bake, prepare the lemon curd. With a hand mixer, beat together butter and sugar until light and fluffy. Beat in each egg one at a time, allowing them to mix completely before beating in another egg. Beat in the lemon juice, salt and lemon zest, until incorporated. Over medium heat, in a double boiler, stir the mixture. Stir mixture frequently, until the mixture begins to thicken (about 15 minutes). Pour into bowl and let cool in fridge. If you have any left overs, place them in an air tight container, and use within a week. Next, make the lemon buttercream frosting. Beat the butter on a medium speed for 30 seconds with a paddle attachment, until smooth. Slowly add in the powdered sugar, 1 cup at a time. Alternate with small splashes of the cream and lemon juice. Once fully mixed, add in the vanilla, lemon zest, and salt, and beat on low until the ingredients are fully incorporated, and the desired consistency is reached. If the frosting is too thick, add in cream (1 teaspoon at a time). If the frosting is too thin, add in more powdered sugar (quarter of a cup at a time). Make the yellow ganache drips next, to allow the mixture to cool before adding to the cake. Heat heavy cream in a heat-proof bowl in the microwave for 45 seconds-1 minute, until bubbling. Gently pour white chocolate chips into the heavy cream, making sure they are fully covered with cream. Allow mixture to sit for 2 minutes. Stir slowly until the cream and white chocolate are combined, then heat again for 20 seconds and stir. Repeat as necessary until all the chocolate bits are fully melted and incorporated. Then add gel food coloring if desired. Allow to cool until desired viscosity is reached. If it seems too thin or thick, you can add a touch more chocolate chips or heavy cream! The type of cream and white chocolate that you use can affect the consistency, so feel free to adjust as needed. I like to put my ganache into plastic squirt bottles when decorating cakes, but you can also use a spoon to drizzle it over cakes. The last component is the meringue. Whisk the egg whites and sugar in a heatproof bowl set over a saucepan of simmering water (do not let the bowl touch the water) until the mixture is warm and the sugar dissolves, 3 to 4 minutes. Remove the bowl from the pan; add the cream of tartar and vanilla and beat with a mixer on medium-high speed until stiff, glossy peaks form, 6 to 8 minutes. Stack and frost layers on a 10 inch, grease-proof, cardboard cake round. Frost a ring of lemon buttercream around the perimeter of the layer, and add a generous scoop of lemon curd into the center of the layer. Spread evenly over the cake layer, then repeat with remaining layers, being sure it stays within the frosting boarder. Cover the cake in a thin crumb coat with remaining lemon frosting, and chill in the freezer or fridge for about 5 minutes. Once the crumb coat is firm to the touch, add a second layer of frosting. Smooth using a bench scraper. 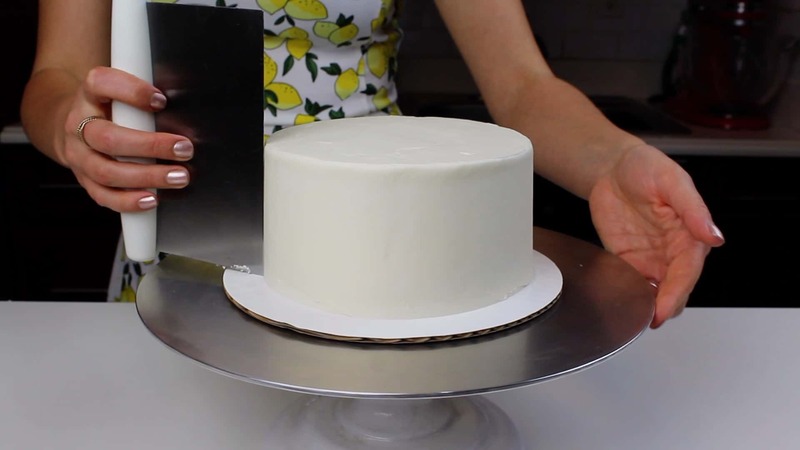 You can see a full tutorial on how to frost a cake with smooth sides here. Once the frosting is chilled, add on the yellow colored white chocolate ganache drips. Always be sure to do a test drip, to ensure that your ganache is at the right temperature. 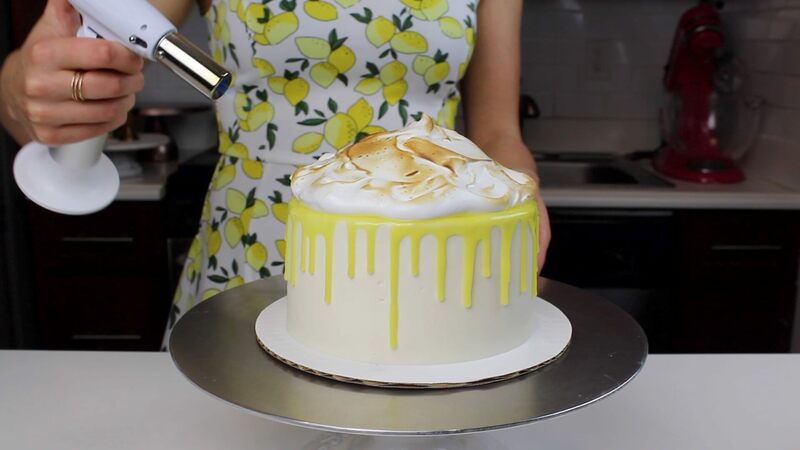 Scoop meringue onto the top of the cake, shaping into a swirling mound using a small offset spatula. Brown the meringue using a kitchen torch, then enjoy! Thanks 🙂 so happy to hear that!! This looks great! When you were making cakes for orders did you ever freeze them after frosting or decoration? Any tips? Getting a little stressed with time management lol. I usually use a Swiss meringue buttercream I’ve never tried American. You are always a go to for inspiration and great info thank you! Thanks! I did, since I almost always made my cakes in advance! I like to put them in the fridge though, just to minimize the amount of temperature shock! If I did freeze a cake, I’d move it in the fridge for a day, to let it thaw slowly, before giving it to a customer! hope that helps, happy baking! Hi, look awesome! I made your vanilla cake today and after an hour all the buttercream began to crack. Do you know why? crack? i have’t really run into that, but maybe the frosting layer was too thin? I like to add a thick layer of frosting, to keep all the layers in place, and to allow the frosting to firm up and crust. I would recommend placing the cake in the fridge once it’s decorated, to help the buttercream keep it’s shape until it crusts. I don’t remember the brand, but it was the top rated option on amazon! I am attempting to make a “book” cake which requires 3 cake recipes. 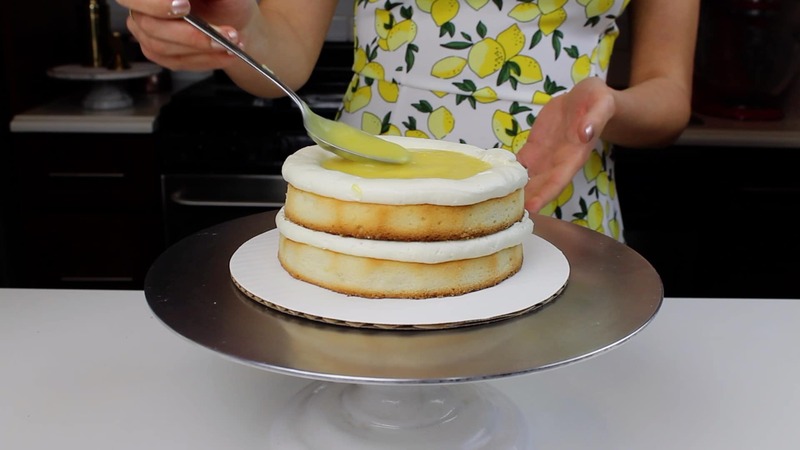 I would love to use this lemon cake and curd recipe. Any suggestions on cooking time? depends on how many layers you’re making, and the size of the layers! Made this today! I doubled the cake recipe after I realized I used 9″ pans instead of 7″. Whoops! The meringue was AMAZING. Such a great recipe! Does the meringue get cooked enough just using the torch? I imagine rhe consistwncy will remain soft like whipped cream. It is still a little bit soft!! but it’s fine to eat that way! How long does this last after making it? Particularly thinking does the meringue topping need to be eaten right away? Or what’s the best way to store it? It should either be eaten immediately, or kept in the fridge! Hi, this looks delicious! I can’t wait to make it, but first could you tell me what type of buttermilk to use? My store has whole or 1%, I assume whole for the fat content? Thank you!